How many people find a sense of purpose in their jobs? Unfortunately, studies show that most do not. Their bodies may put in long hours, but their hearts and minds never punch in. And that's a terrible dilemma for organizations trying to motivate their workforces to do more with less. 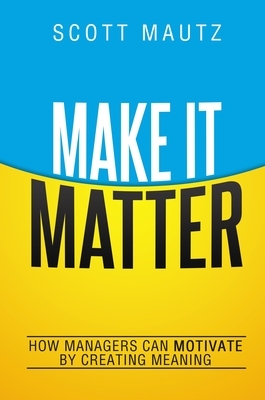 Make It Matter is the antidote to crisis levels of disengagement. This upbeat, original book shows how meaning-rich workplaces connect, inspire, and catapult employees into new realms of productivity and well-being. Not only does the book make a convincing case for change, it also explains how to become the kind of business where people love to work, and the kind of manager people love to work for. Insightful research findings, stories, and guidelines help readers create: Direction: reframing work to add meaning Discovery: offering challenges and thoughtful opportunities to learn and grow Devotion: cultivating an authentic, caring culture, free from corrosive behaviors When people feel that they matter, they give their all. Channel that power and everyone profits.